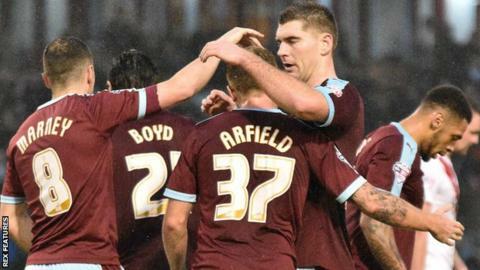 Burnley are on track to secure an immediate return to the Premier League, says boss Sean Dyche. The Clarets ended a six-game winless run with a 4-0 win over Charlton at Turf Moor and are fifth in the Championship, six points off second. Dyche's side were relegated after just one season in the top flight last year. "There is a big thing about perception in football and it's my job to see through that and through the noise," he told BBC Radio Lancashire. "Well in the last eight weeks we've taken 16 points and they've taken 15 - the fact is we're still on course, we believe in what we're doing. "The challenge is massive, of course, and we know the stats of teams that come out of the Premier League and how difficult it is to get involved in going back up, but there is a lot of life in what we're doing here." Two goals from Scott Arfield as well as strikes from Andre Gray and Sam Vokes secured Burnley's biggest win since August 2013 when they beat York by the same score line. "The main message at half-time was to relax and play," added Dyche. "Play with that freedom, play with that smile on your face as you know what you're doing and I trust you. "I thought second half they did exactly that and I thought some of the play was as good as I've seen here."